From frisky pre-codes to a small supporting role in 1978’s Grease, there’s no denying Joan Blondell’s talent and screen presence. And it’s no surprise that she became such a star, with her show biz upbringing. Rose Joan Blondell was born into a family of vaudeville performers on August 30, 1906. Her parents were traveling performers, carting the family around the world to put on spectacular shows. Rather than a cradle, young Joan slept in a property trunk. In a family like this, only so much time can pass before the children take the stage as well, and Joan was no exception. She made her first appearance at the age of only four months, carried across the stage in a cradle. By the time she was a teenager, Joan had seen the world with her family, performing all the while. It was then that the family finally settled in Dallas, Texas, where Joan found pageant success under the name “Rosebud Blondell.” She even placed fourth in the 1926 Miss America pageant. Glamour of performance and pageantry aside, it seemed that “Rosebud” was headed for quite a different life than her parents had led. Rather than heading for the big city immediately with dreams of fame or traveling as a performer, she attended a teacher’s college in Denton, Texas. Still, the performance bug bit and eventually she returned to New York City, where she had been born. There she joined a stock company, appeared on Broadway and even starred alongside James Cagney in the stage production of Penny Arcade – the production that gave her the first big break. Penny Arcade wasn’t a huge success in the New York theater circuit, running for only a few weeks, but it impressed “The World’s Greatest Entertainer” Al Jolson. Jolson quickly bought the rights to the play and then sold them to Warner Bros. on the condition that Blondell and Cagney reprise their roles in the film version. Joan left Warner in 1939. By the end of the 1930s, she had appeared in nearly 50 films, and her career was still far from stopping. Joan went on to appear in over 150 titles, working in both film and television until her death in the late 1970s. (Her final performance was released posthumously, in 1981.) During her long career, she worked with Glenda Farrell, Buster Keaton, Bobby Sherman, Joe E. Brown, John Cassavetes and Barbara Stanwyck among many, many other greats. She also worked outside of the screen, appearing in stage productions and even publishing a novel (1972’s Center Door Fancy). Joan, with her mesmerisingly large eyes and consistently fantastic performances, is a personal favorite of mine. The following are just a few of my favorite roles from her extensive filmography. In Night Nurse (1931), Joan stars alongside another TMP favorite, Barbara Stanwyck. Stanwyck takes the lead, but Joan is a definite scene-stealer in her role of Miss Maloney, Stanwyck’s roommate and fellow nurse. The two become best friends as they become registered nurses and attempt to save a few neglected children. Joan’s performance plays up the subtle comedy that runs underneath the dramatic central plot of the film, and she plays very well off of Stanwyck. Two years after Night Nurse and Other Men’s Women, Joan delivered one of the most enduring and powerful performances of her career in Gold Diggers of 1933‘s “Remember My Forgotten Man” musical number. Joan is Carol, one of four showgirls struggling to make it during the Depression. Her character is, again, quite spunky and fun but the humor is lost in favor of a somber mood for the film’s final number. “Remember My Forgotten Man” is a poignant, brutally honest analysis of the economic environment during the depression and how it was affecting Americans, and Joan pulls it off perfectly. 1936 found Joan starring alongside some of Cagney’s fellow “gangster” types: Edward G. Robinson and Humphrey Bogart, in Bullets or Ballots. Joan is Lee Morgan, a woman living on the wrong side of the law by running a successful but very illegal lottery along with her assistant, Nellie LaFleur (portrayed by Louise Beavers). Her character is extremely likeable, treating everyone fairly and working with only the best intentions. She’s a strong but kind woman, and Blondell’s performance brings a strong sense of empathy to Lee Morgan. Jumping far ahead into the future, Joan appeared in Grease in 1978. Joan’s role is small here, again. She portrays Vi, a waitress at the diner where all of the high school kids like to hang out. I love this film as a whole (Who doesn’t? ), but as a classic film fan I’m particularly fond of it because it was my first exposure to the talent of Joan. I’ve been watching Grease since childhood – long before I knew what a pre-code was or had seen many classic films. August 30, 2012 marks the 106th anniversary of Joan’s entrance into the world. Though the 1930s were obviously my favorite period of Joan films, she showed immense talent in every decade of her career. I wouldn’t be surprised if that first stage appearance, when she was simply carried by another actor, earned rave reviews. She was just that good! Feel free to share your own favorite films and memories of this wonderful actress in the comments. Joan did so much in helping establish Warner Brothers as the grittiest, most exciting studio of the early 1930s. She was the rare actress who could save a picture with only a bit part – her role in the Loretta Young starring Big Business Girl being a great example. It’s astounding that she always brought so much energy and sass to her roles considering how gruelingly productive she was in that decade. Though I’d hesitate to call it a great film, I think her performance in Blondie Johnson is really remarkable, and moreover it’s a great example of the dynamic, free-spirited roles afforded to women in pre-Code Hollywood. I haven’t seen Blondie Johnson (Yet! – I’m working on her filmography) but I agree re: Big Business Girl. I also enjoyed Ricardo Cortez in that one. Joan had a gift for stealing the show completely, no matter how small her role was. Thanks for reading! 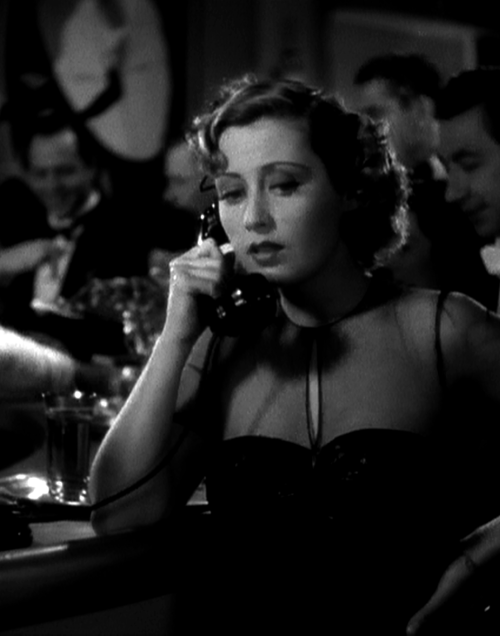 I absolutely adore Joan Blondell. She is as cute as a button and has a way of making a movie that much better. She’s definitely in my top 5. She really had a gift for elevating the material she worked with. I’ve seen many films that I wouldn’t have liked if she hadn’t filled the role – she’s just so consistently great and had such a captivating screen presence that she could completely save a film, even if she wasn’t a lead in it!